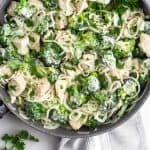 Whole30 Chicken and Broccoli Alfredo! 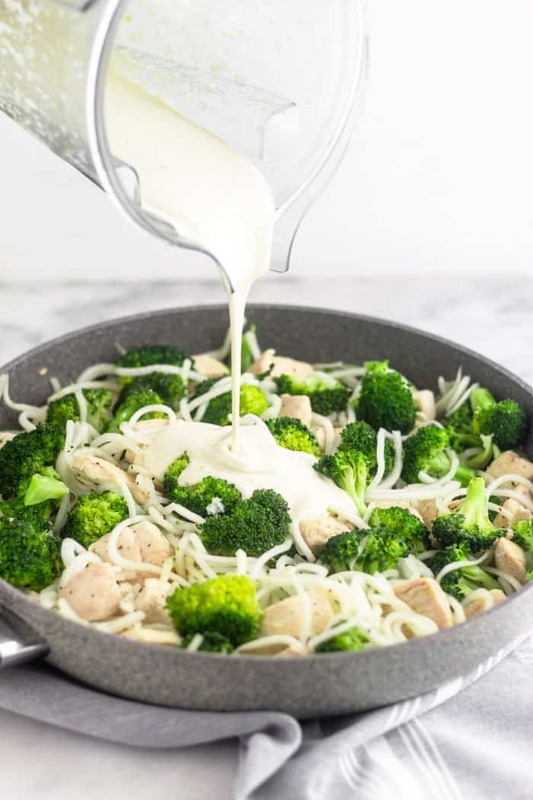 A thick & creamy dairy free sauce tossed with chicken, broccoli, and veggie noodles for an easy paleo, low carb, and Keto friendly dish! Yep! You read the title of this post right! 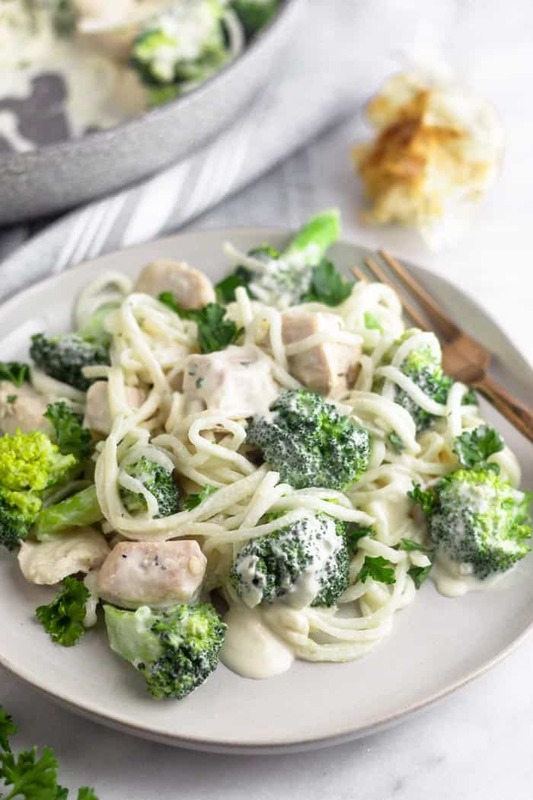 Today I’m bringing you a quick and healthy Whole30 Chicken and Broccoli Alfredo. 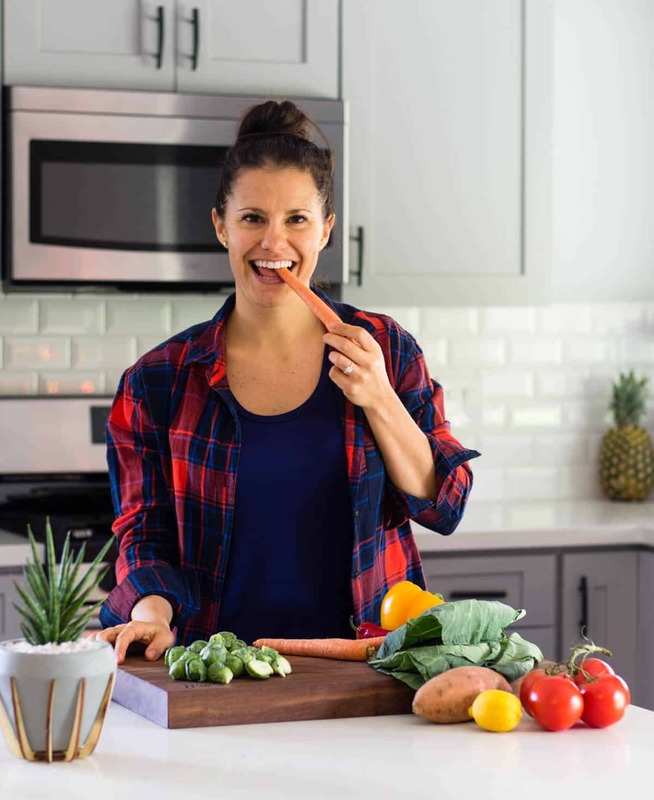 I sent this recipe to my newsletter subscribers (if you aren’t on the list, get on it!) earlier in the month and everyone LOVED it! I was going to share it next month, but I am still getting questions about where the recipe is. So I figured I would share it with you guys! 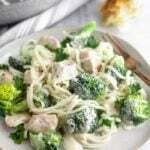 Growing up, chicken and broccoli Alfredo was one of my favorite meals. My mom would make the canned soup version (probably from my requests) and I absolutely loved it. Not the best for you, but dang I remember it being so good. Until something tragic happened…. Do you ever eat something and then get sick after eating it and can’t have it again for a long, long time? Well this happened to me. 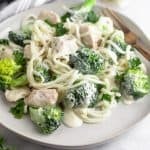 I was thoroughly enjoying the chicken and broccoli Alfredo that my mom made for the family one night. Well something didn’t sit right with me, or maybe I just got sick, but in the middle of the night, let’s just say it all came back up. The eating of chicken and broccoli Alfredo stopped for quite some time after that haha. Seems a little counterintuitive to share a story like that when I am trying to get you to try this recipe, but I promise you this version made me change my mind again! 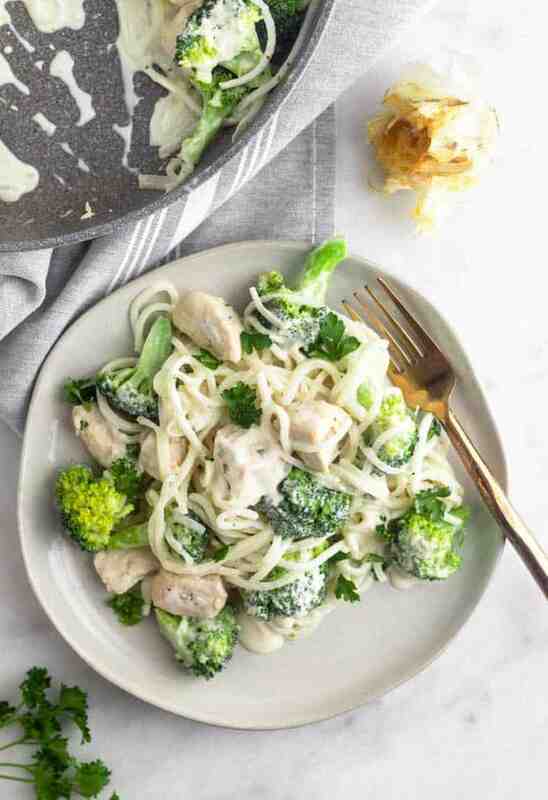 This Whole30 recipe combines a dairy free Alfredo sauce with chicken, broccoli, and turnip noodles for an easy dinner that will be ready in about 20 minutes! 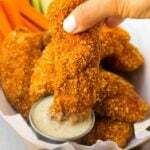 It is legit healthy comfort food at it’s finest and I promise even the picker eaters will love it! So much better for you than the classic canned soup kind I grew up with. 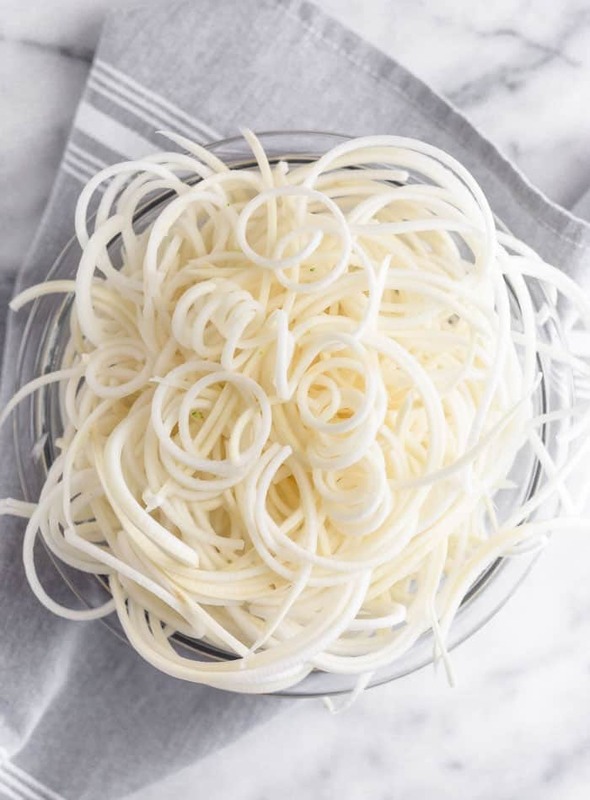 First you make your veggie noodles by running them through your spiralizer. 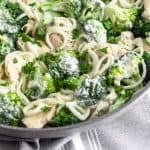 Then make the vegan Alfredo sauce (more on that below). Next you cook the chicken for a few minutes until it’s browned (but not cooked all the way through). Then you add the broccoli and sauté that for a few more minutes. Add the noodles and cook for a few more minutes and then stir in the sauce until it’s all combined. Top with some fresh parsley and you have an easy and delicious Whole30 approved meal. You guys should know by now I love adding cashews to sauces. They make the most dreamy consistency! 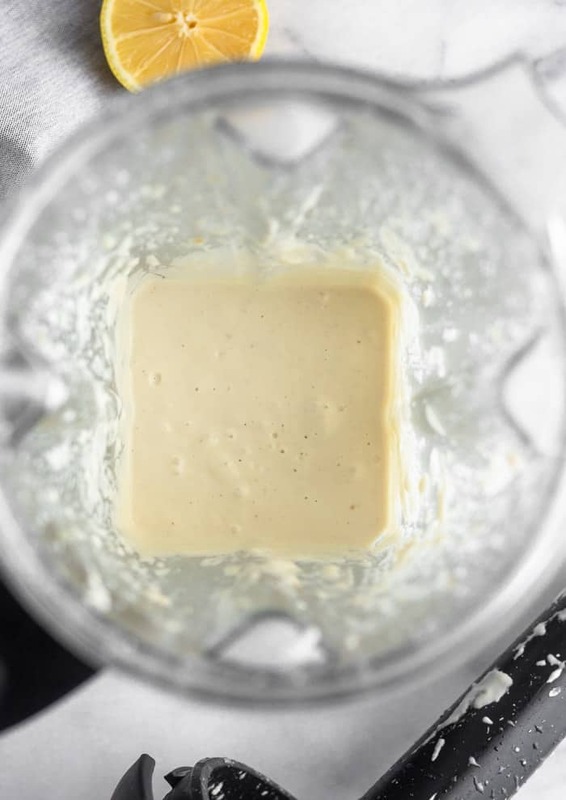 To make a dairy free Alfredo sauce, we are using few simple ingredients like cashews, roasted garlic, coconut milk, lemon juice, water, and salt. First you need to soak the cashews overnight in water. If you forget to soak them, you can just put them in a bowl with water and microwave for a minute (this is what I usually do!). Then you add the drained and soaked cashews with all the ingredients to the high powdered blender and blend until smooth! Adjust to taste, but it is that easy! Pro tip – I like to roast my garlic ahead of time to save time. You can make it on the weekend and save it for during the week when you want to make the sauce. Can I use different a different noodle? If you are thinking to yourself, what is a turnip and do I have to use that, let’s talk about it. If you have never had a turnip, it is a root veggie. Depending on the size and maturity, they can either taste slightly sweet (younger turnips) or have a slight bitterness (mature ones). Younger ones can be eaten raw, mature ones should be cooked. I really love them, but I know not everyone will. I encourage you to give the turnip noodles a try, but if you are feeding a family/little ones, they might not like them. 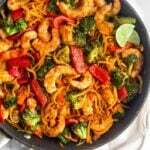 You can easily substitute zucchini noodles (just make sure you squeeze all the water out of them or they will make the sauce runny), sweet potato noodles, parsnips noodles, or anything you really like. 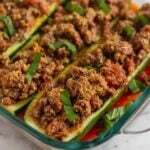 It would be great over cauliflower rice as well! If you aren’t doing the Whole30, you can use gluten free pasta or pasta of your choice! I hope you love this recipe as much as we do! Michael even loved it and he is not a veggie noodle type of guy. It makes for an easy and comforting weeknight meal or you can even meal prep it! Make a big batch and save the leftovers for a quick lunch during the week. It saves well in the fridge for up to 5 days. Spiralize your turnips by running them through your spiralizer. Set aside. Make the sauce. Place all the ingredients into a Vitamix or high powered blender and blend until smooth and creamy, about 45 seconds. Heat a large nonstick skillet over medium heat. Add oil and let it get hot, about 30 seconds. Add chicken and salt and cook for 3-5 minutes, stirring occasionally until browned (does not have to be cooked all the way through yet). Add broccoli and salt and pepper and sauté for another 5 minutes. Add noodles and cook for 2-3 more minutes until cooked to your preference. 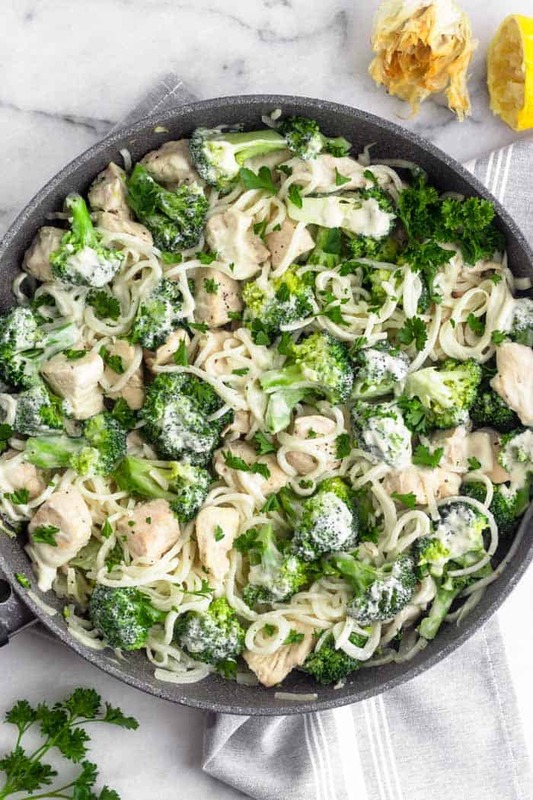 Depending on how large your pan is, you might need to take out the chicken and broccoli, cook the noddles, and then add it back in. Turn off the heat and add in sauce and mix until well combined and warmed through. **I roast my garlic ahead of time. To roast garlic, preheat the oven to 375 degrees Fahrenheit. Peel the outer layers of the garlic skin off leaving the cloves still attached. Chop off the top of the bulb. 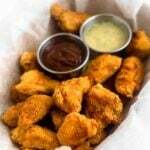 Place in aluminum foil and drizzle with 1/2 teaspoon oil over the exposed surface, letting the oil sink down in the cloves, Wrap the garlic in aluminum foil and roast in the oven for 45 until until cloves are soft. Squeeze cloves from out of the bulb. Legit delicious and amazing! 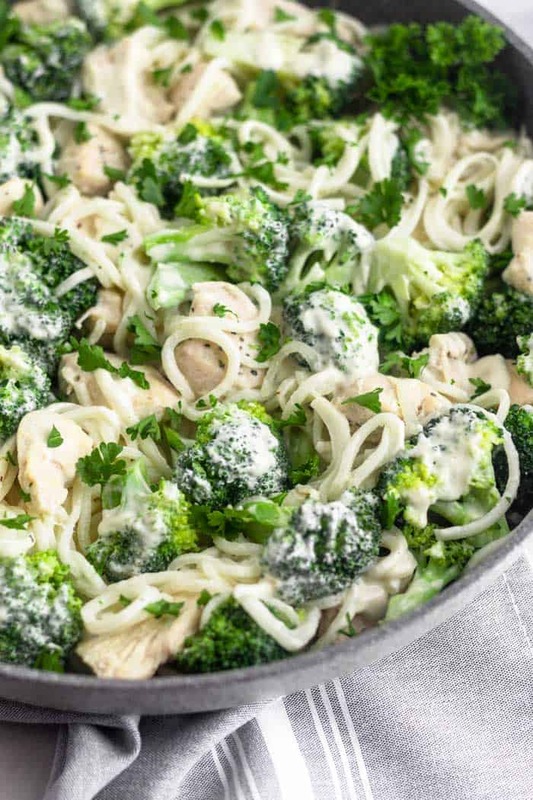 The sauce is great (really creamy and flavorful) and sticks really well to the noodles. I hadn’t thought to use turnips before and I’m so glad I did. I love a roasted turnip and was pleasantly surprised by the young turnip noods! Great recipe. Adding it to my whole30 rotation for the nights when you want something other than cauli rice bowls and eggs! Thanks Kelly! Yay, so glad to hear that! I really love the turnip noodles too – they are a nice change from the usual zucchini or sweet potato noodles. Thanks for trying it! Haha yay!! I love a good sauce! So glad you liked it Bridget and thanks for trying it! Mmmm delicious creamy sauce! I love this fish! Branching out to try the turnip noodles and I am pleasantly surprised! So glad you hear you liked the noodles! They are a nice change I feel! Thanks for trying it Jen! OMG dying! That would be so so good in these!! So glad you liked it and thanks for trying Haley! I made this for dinner and it was delicious. I didn’t have chicken breast so I used thighs and I didn’t have a veggie spiral for the turnips so I used a cheese grater and it worked great! It will be one of our new favorites. I love how you improvised Jennifer! Glad you enjoyed and thanks for trying it! This was SO delicious!! I’ve made it twice already. The first time, I made the sauce a couple of days ahead of time so the flavors had time to meld. If you have time for that, I would recommend it. It was yummy the second time I made it as well!! Also, I cheated and used pre-made zucchini noodles instead of turnips to save time. 🙂 Really, really good! I love that idea, I am going to try that next time! Any kind of noodle is okay in my book! Thanks for trying it Sarah, thanks so much for trying it! Made this dish last night for dinner! Aside from the time it took to roast the garlic (unfortunately I wasn’t prepared) this dish came together very quickly and makes for an easy weeknight meal! I had never had turnip noodles before and was pleasantly surprised at how tasty they were! (They are also much easier to spiralize than zucchini.) I also didn’t have any coconut milk, so I improvised and added a tablespoon of arrowroot powder to two tablespoons of the water before I blended the sauce ingredients together. Came out nice and creamy. The hubs asked for me to make it again, so it is even husband approved! So glad you liked the turnip noodles Tina! Happy to hear you guys liked it and thanks for trying it Tina! So delicious! I didn’t have any cashews on hand so I substituted with macadamia nuts and it turned out great. How long will this sauce keep? Already excited to make it again…thank you! Oh yum, I love that substitution! It should keep about 5-7 days in the fridge. Thanks for trying it Jules and I’m glad you liked it!